Kelley and Dave will discuss their experience starting up and running Local Economy Centers. 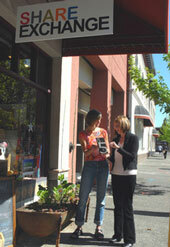 A Local Economy Center is a place to incubate and showcase solutions for better, smarter living. These are community-based places where the new local economy is being built and grass roots economic development is put into action. One more week to enter your actions towardsBuilding Community, Growing Food, Saving Water or Conserving Energy! Place your orders here and consider buying in bulk too. We want Transition initiatives and other community groups to be able to buy DVDs of ‘In Transition 2.0′ to sell at their events to allow them to make some money to support their work. if you buy over 50 you get a 40% discount(up to a maximum purchase of 99 dvd’s). if you wish to purchase DVD's in bulk or wish to purchase more than 99 DVDs, get in touch with us. 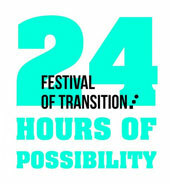 The nationwide ‘Festival of Transition’, coordinated by nef (the new economics foundation) and the Transition Network, has begun, running until 20th June, the first day of the 20th UN Earth Summit in Rio. Instead of traveling to Brazil, the Festival gives people the opportunity to do something positive about climate change and the economic crisis in their own communities. This week May 20-26, we are celebrating National Potluck Week! If you have not registered an action for the month-long Transition Home & Garden Challenge - here is a great idea: Host a community potluck and then let us know by registering it as an action of the Transition Challenge too. After all the Challenge is about: Saving water, conserving energy, growing food and building community! Potlucks are a great way to do achieve these goals. 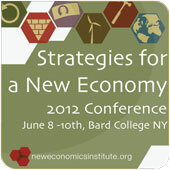 On Wednesday, July 18, 2012, Transition Towns are invited to be a part of a national effort to support local economic initiatives. On this day,Fixing the Future, a documentary that showcases working models for thriving economies, will screen in at least 50 theaters in cities across the U.S. Due to a wildly successful PBS version, the filmmakers have made a new, feature length version of the documentary that you can be among the first to see. In Fixing the Future, host David Brancaccio (of NOW on PBS) visits people and organizations across America that are attempting a revolution: the reinvention of the American economy. By featuring communities using sustainable and innovative approaches to create jobs and build prosperity, Fixing the Future inspires hope and renewal in a people overwhelmed by economic collapse. Do you frequently get asked questions about the issues which inspired you to get involved with Transition? If so maybe you'll find it useful to check out Richard Heinberg's answers to the Top 11 FAQs he gets asked when he's out on the road. Richard also took part in the latest in our series of Interactive Video Chats at Energy Bulletin. You can catch up with what Richard and historian, political economist, activist and writer Gar Alperovitz had to say as they discussed 'Equality and Inequality in a Shrinking Economy--Strategies and Consequences'.